Terri you are amazing, how can you let an envelope wait... I would have been too excited!! You sheowed us borgeous things today, the little envelope and bracelet for your sister, the card and ATC from your friend and last but not least the bannertutorail, inviting us at you place... thanks so much for sharing! The braclet and earring you made for your sister are divine! If she dosen't like them I know someone who does. teeheehee. and what a wonderful gift you received in the mail and perfect over a cup of tea! This post is just filled with pretties! I love the beautiful bracelet and earrings. And the envelope you created is such a special touch. How could your sister not love such a beautiful gift? how beautiful! 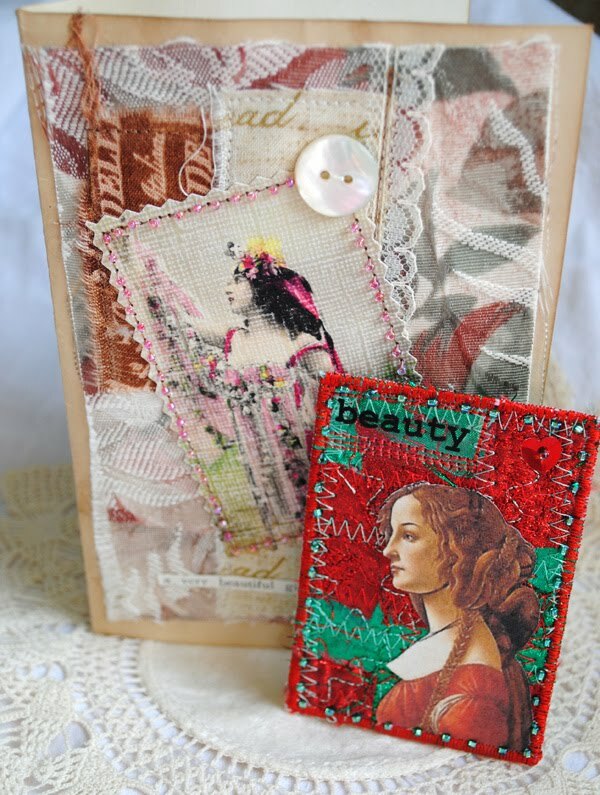 i love the aged envelope and the ATCs from your friend are gorgeous! i also love the bracelet and little envelope for your sister, how lucky she is! thanks so much for the banner tutorial, I've watched it and love it!!! Delightful post! I can't imagine your sister not being thrilled with her gift! And your sweet packet - I will pop over to see your friend also. Haven't been to see you for a bit - and it is always such a lovely experience, I do adore your posts. Thanks for your generousity with the tutorials! Oh I just love the envelope and the jewelry you made for her! She will absolutely love it!! 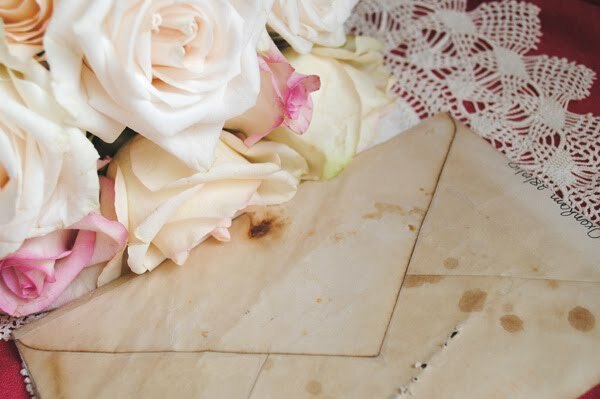 that envelope is just gorgeous...surely to become a treasured keepsake. And you are so kind to make a tute video. Going to check it out now. Have a wonderful day and weekend. You are so talented. I usually only stop by on Tuesdays for tea, but I'm so glad that I got to see your other work as well. That envelope is amazing. What a sweet sister. I'm off to check out your friend's blog. Clearly she is talented too! Terri, your sister will be joyously giddy with her gift! It's all so radiant. 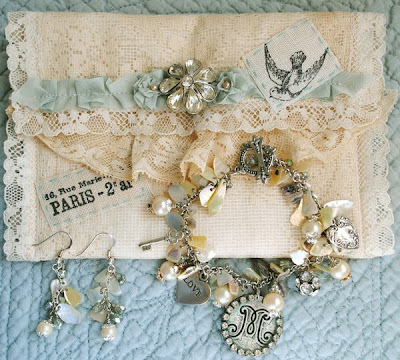 The bracelet and earrings are perfect for Spring,and the envelope to keep them in is beautiful and romantic. She's a lucky sister!! 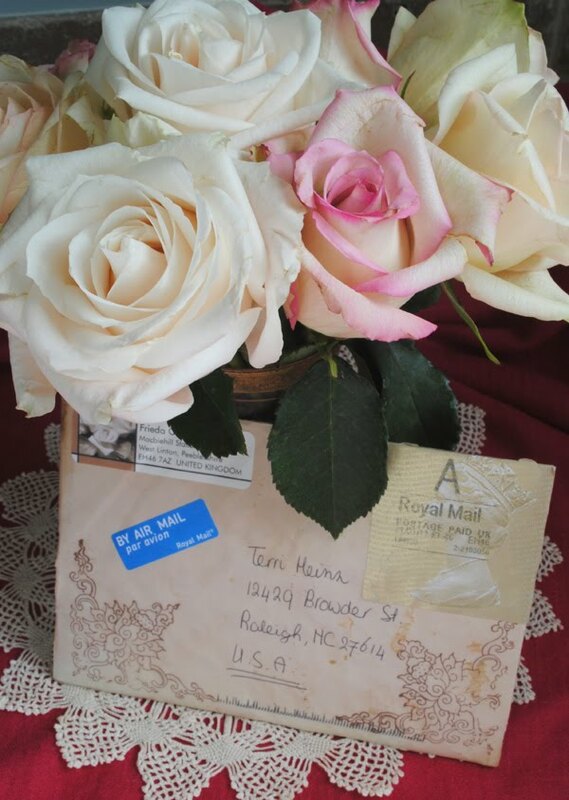 Speaking of romantic, the envelope and card you received in the mail is also exquisitely romantic. What a nice surprise to receive. Email just can't really equal it, can it. Thank you for sharing today Terri...You inspired me to make a little gift for my own sister today. What a delightful surprise in your mail also! You never cease to amaze me, Terri! The bracelet and earrings and fabric envelope are all just stunning! And isn't it fun to receive a beautiful, handmade gift in the mail? I love the banner, also--I can't wait to try your tutorial with some of the images I have on hand--thank you for sharing all of this! I can't wait to watch your video. Your sister is going to adore what you made her....and that lacey envelope is just so special. Wonderful gift from her wonderful sister! And your ATC's are so pretty....she is a talented woman for sure. 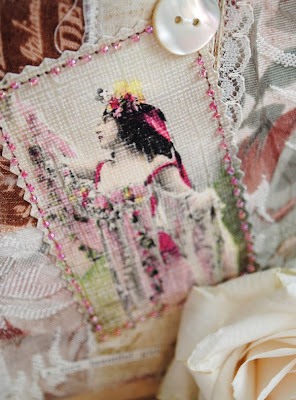 I visit her blog now and then and amazed at what she can do! Glad the weather is getting more spring-like for you. I'm so pleased you liked your surprise, Terri. And you've photographed it all beautifully! And your sister is in for such a treat!! 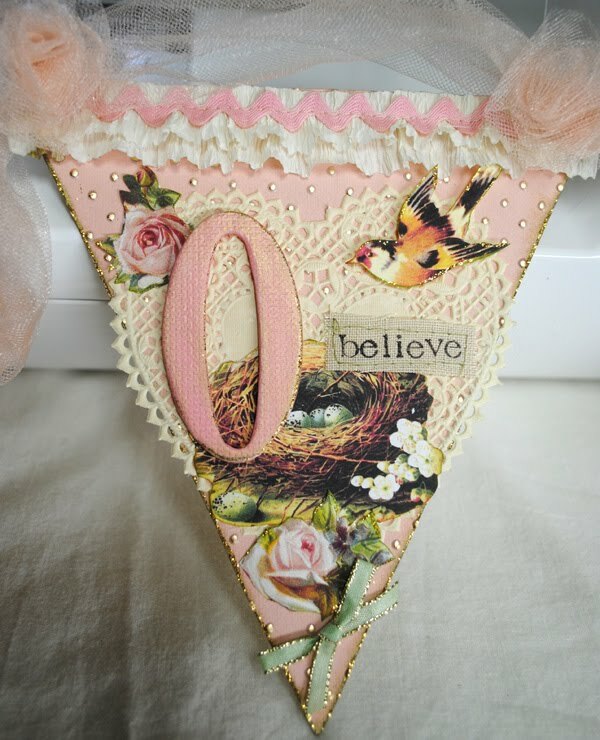 You make lovely ,beautiful and pretty things! your gift for your sister is wonderfull-the most fantasticjewlery, and the envelope is gorgeus- I think she has been over her head happy to recieve this beauties. And your own gifts from your wonderfully giftet friend, is so gorgeus, to. I have been visiting your tutorial,-thanks so much, it is a great show- and wonderfully explained. 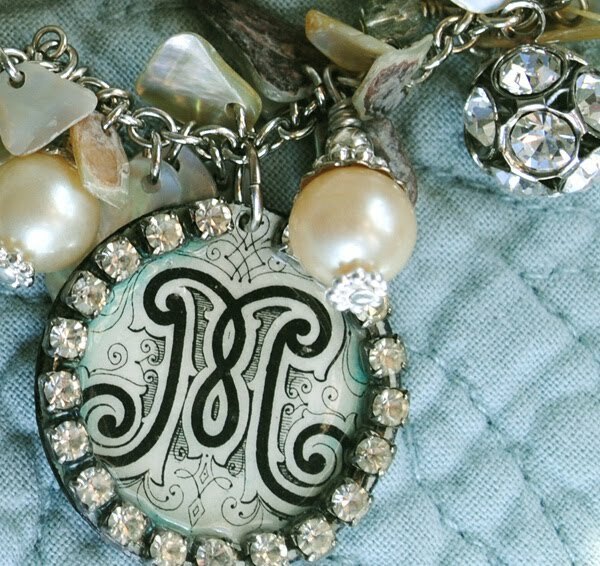 Oh my goodness the gift you made for your sister is stunning!!! Really, it should be on the cover of Stampington's jewelry magazine!! The little pouch is just beautiful! Hope you're having a great day. Lucky sister! What a beautiful gift. Can't wait to check out your new tutorial. You should have your own show on HGTV! I have not made fabric envelope sleeves in such a long time...my mother and I would make them out of lace and pink taffeta back in the eighties, when I was a teenager! I just might have to make them again...thanks to you and your always artful inspirations! I was just on your YouTube channel...enjoying each one of your videos, which really are a pleasure to watch. You are such a patient and thorough teacher! I love your completed school house..complete with it's fairies and wooden furniture! My daughter and I want to try something like this someday! Thanks for sharing .. You truly are an inspirational artist! I love your paper shoes! Oh my goodness! What a gorgeous collection of projects. Stunning! Thanks for stopping by my blog also, and thanks for the nice comment on my LO! Hello dear friend.......what a simply stunning piece you made for your sister..and the beautiful case to hold it. She will no doubt swoon. the pieces from Frieda are so delicious...and the envelope so pretty. I totally understand your waiting for a special moment to open and savor..It makes it even more special. the second part of your banner is delightful and I look forward to watching the video..I so love your videos. I feel like I am right there sharing it with you. thank you for the time you take to make these little tutorials for us to enjoy. It's a precious and generous gift to us as I know how long it takes to create them. Bless you. wishing you an extra measure of joy today. Sorry to post this here on your blog, but I didn't know how else to contact you. I was wondering how you get an invitation to the Marie Anoinette Mail Art Group. I am very interested. Terri, everything is beautiful! The jewelry, the fabric package you made for them, and the gift you received. Congratulations for the beautiful work, you're a great artist. The jewelry envelope is gorgeous and the card and ATC are great. You share so much beauty with us. Thank you.